Everybody loves a bright white smile, and there are a variety of products and procedures available to help you improve the look of yours. Many people are satisfied with the sparkle they get from daily oral hygiene and regular cleanings at our office, but if you decide you would like to go beyond this to make your smile look brighter, you should investigate all of your whitening options. In-office bleaching. This procedure is called chair side bleaching and usually requires only one office visit. The dentist will apply either a protective gel to your gums or a rubber shield to protect the oral soft tissues. A bleaching agent is then applied to the teeth, and a special light may be used. Lasers have been used during tooth whitening procedures to enhance the action of the whitening agent. 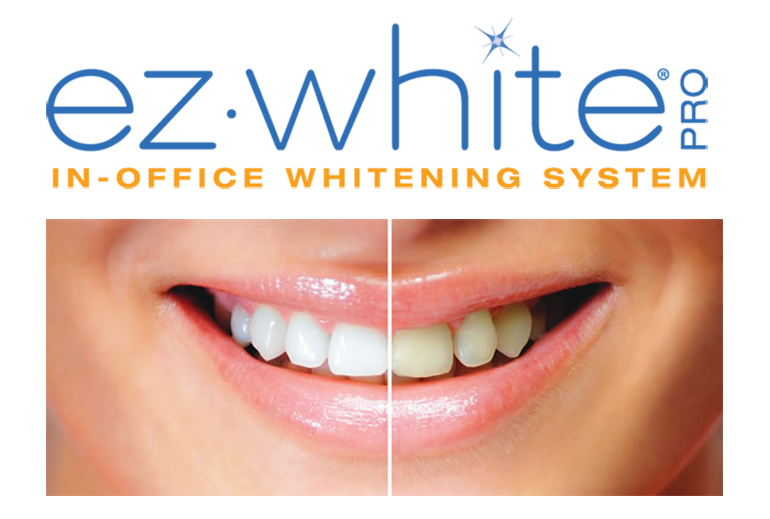 Our In-office treatment is limited to EZ White Pro. Take Home Kits. We offer the use of Opalescence whitening take home system. Opalescence gels contain an active whitening ingredient (either carbamide peroxide or hydrogen peroxide) that penetrates your enamel to get to discolored molecules. Oxygen molecules from the whitening agents react with the discolored molecules in your teeth, breaking the bonds that hold them together. The oxygen molecules spread, whitening the entire tooth. As a result, you are left with a brighter, whiter smile. If you are interested in teeth whitening, it’s a good idea to discuss it carefully with your dentist first. Schedule an appointment for consultation on our website or by calling us directly at (718)897-3434.